My first art tutor was nuts for Cy Twombly, but I was so terrified of painting at that point, and wrestling with all of it really, that I really stuggled to warm to the huge scale and raw energy of Twombly’s works. In Germany last summer though I had a day in Munich to myself, and headed to see the newly opened Branhorst Museum. There I eventually spent an hour with the Lepanto works. Quietly overcome. The rooms on the upper level also vary dramatically in scale but are lit consistently by way of an Okalux light. 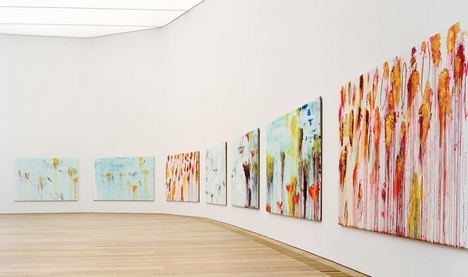 At present, the whole floor is given over to works by Cy Twombly, some from the Brandhorst collection and a number loaned by the artist but made in response to the spaces of the new building. Among those from the museum’s own holdings is a series of 12 gigantic canvasses, which depict the 1571 Battle of Lepanto. The Lepanto Cycle is one of the principal monuments of Twombly’s late career and — uniquely among the works in the collection — has been put on permanent display in a gallery that has been tailored to its specific needs. This room occupies the upper level of the “head” but its plan has been developed independently of the external form. The given geometry of the room has been dummied out by a series of faceting planes, with the effect that as visitors enter through a centrally located door they discover the entire series laid out panoramically in front of them. It really is a tremendous coup de théâtre. Seam, Installation View 2007 Catherine Bertola. Looking at the YSP website I came across work by Catherine Bertola which I really like, so googled her and came upon the Workplace Gallery Website, which has an exhibition of her work on until the 23rd of September this year. I was flabbergasted to see her beautiful Seam works shown, and especially the pic above, which I have inadvertently managed to replicate! I remember talking with fellow students about this when we started out, and frequent cries of ‘someone else has already made my work!’ would echo round those studios, proclaiming a mixed sense of frustration, jealousy and despair. What’s the point if it’s already been done? What’s the point if there are quicker minds than mine out there, so far ahead in their thinking than me?? I feel validated that I’m on the right track, whatever that might be for me, and I feel really grateful the artist that has already made that thing I was thinking about has done it for me, thank you very much, which is nothing but helpful. I am very much looking forward to visiting the Workplace Gallery next week and getting up close enough to really appreciate the workmanship which is clearly an integral part of Bertola’s work. Fantastic that the show is on right at this moment! Fantastic that Bertola is working with the overlooked, cherishing the parts of the world which aren’t ordinarily valued, including dust and cobwebs- this interest has clearly filtered into the world to be picked up by people (like me). I feel work brewing already… Thanks Catherine Bertola, thank you for your beautiful work. Drawing on our group experience of previous shows we have produced, the whole group has worked really hard to present a show which is mature and optimistic. To me it feels as if the work exhibited is both a summation of the past 2 years working together, and a proposal for where the work will move on to next. Work is presented by Lauren Alderslade, Joanna Brown, Mercedes Ferrari, Susan Keshet, Margaux le Lonquer, Archie Muir-MaKenzie, Omar Saif and Tuesday Schumacher Jones and Charlotte Willoughby-Parsons. The development of practices over the course, and the freedoms it offers are shown in the variety of mediums on show. For me personally, it has been of tremendous benefit to have worked in a shared space with artists working in different ways, as it has exposed me to the motivations and intentions others use to create work. This has caused me repeatedly to question my own choices, resulting in a more rigorous critique and belief in my work. Lauren has developed into a confident painter this year, after starting the course doing lots of sculptural work. Observing her as she morphed figures and juxtaposed textures, I got a real sense of the 3D feeding back into her 2D work, resulting in paintings which feature hybrid animals, and a drawing which takes on a tangible presence as it gallops across and up a wall. I am looking forward to watching Lauren develop further on the Painting BA at Brighton. Joanna Brown’s work has moved in the opposite direction to Laurens’, from 2D to 3D, whilst like Lauren, maintaining the interest and concepts driving both. 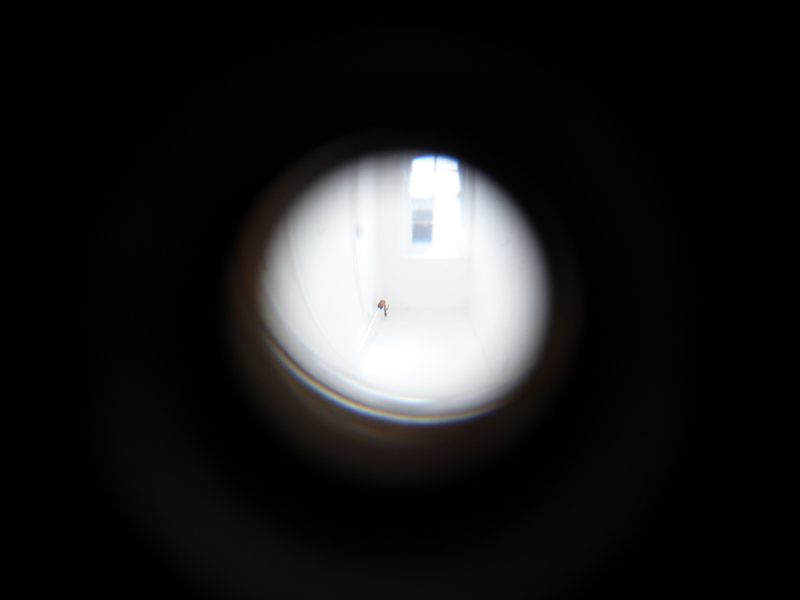 In the work Here and There, the observer enters a darkened space and is presented with 2 similar spy holes to peer through. Whilst the view is similar , with each view the seeming mirror image of the other, it creates the conundrum of how it’s done. The feeling of intrigue and confusion, interest and the yearning to understand, are the elegant expression of an inquiry into human responses to each valuable moment of life. Joanna’s work pauses time for me, makes me notice how I have stopped thinking momentarily to observe and appreciate the observing. Having previously sought to express these moments in paintings featuring crashing waves or volcanoes of colour, this subtle installation shows a maturity and continuity of work. 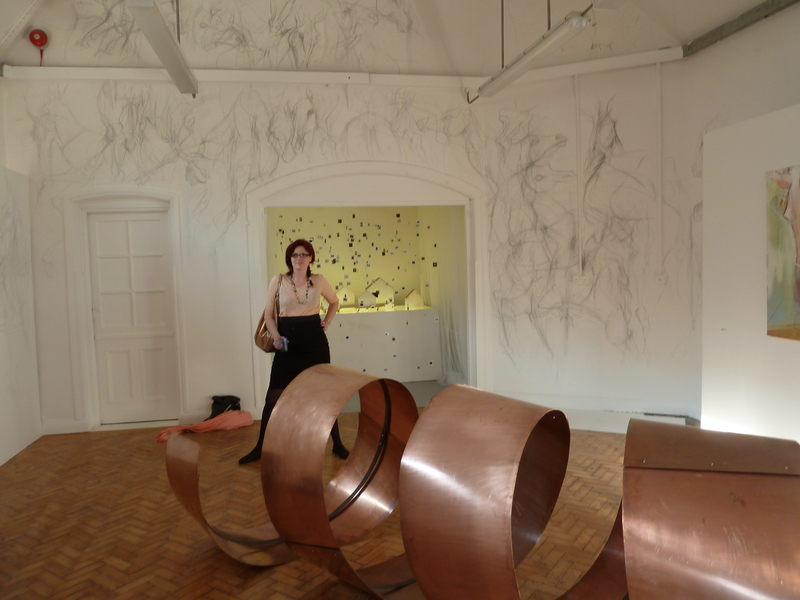 My own work was presented as a large sculptural piece, accompanied by subtle interventions within the building and the intatllation of a band of wide copper tape encircling the studio building. 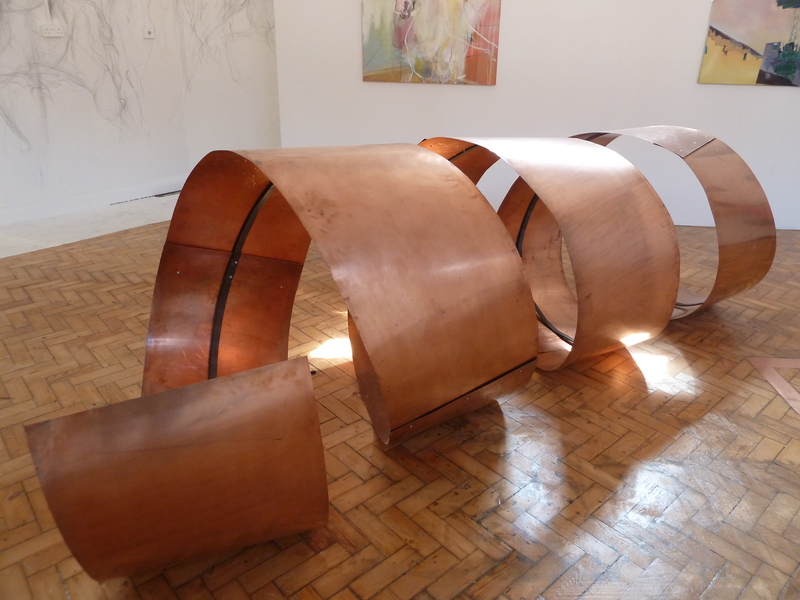 Call (large), 2011 is the culmination of a year spent considering the qualities of the copper as a material, and the uses it is put to by man, coupled with the process of sharing a space and working closely and intensely with people and tutors over the course. The personal reflections this provokes, including conversations and concerns are involved in the production of my work on a personal level, and are presented for exhibition in an abstract yet direct manner. 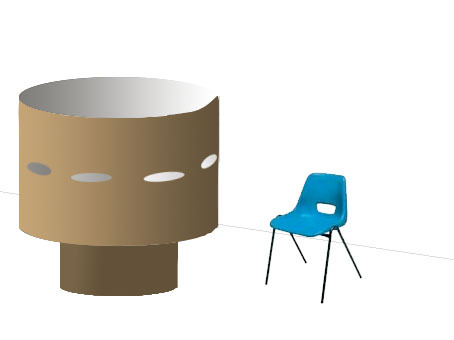 The scale of the copper coil invites the observer to move around in space to view it from all sides, and serves to highlight the properties of the metal, including reflection and sharp edges. In contrast to the weight of the material, it is formed in a way which appears springy and lithe, as it defies gravity and maintains it’s shape. The movement implied by the coil is fed by the animated drawings of Lauren on the wall behind, and results in the upstairs gallery feeding back down into the gallery below, which features work which draws the visitor into the furthest corners of the space. 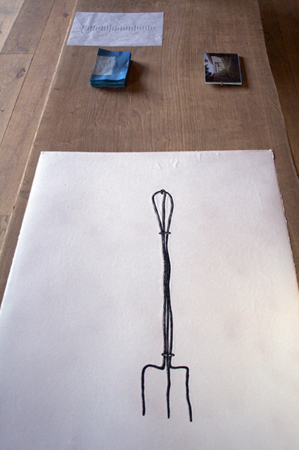 The overall impression is of a successful exhibition demostrating the co-operation of a group of artists. I feel very strongly that as a group we have worked well together, and have been lucky to have been in the same place at the same time. Thanks to the building for providing cover for us for the last 2 years. Watching Manufactured Landscapes recently, I was stunned when it included the statement that there is more gold contained in one ton of scrapped mobile phones than in one ton of gold ore. 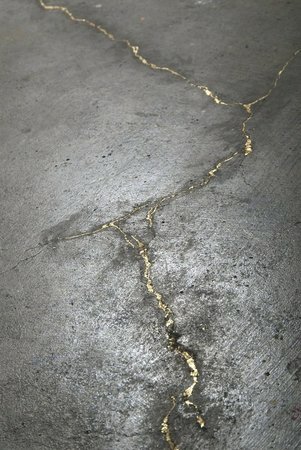 This notion of the value placed on metals and resources which I have been working on for the year seems to be becoming part of the social consciousness, and high profile artists such as Jennifer Baichwal, the documentary maker, and Edward Burtynsky whose work is the focus of the film, are contributing to the spreading of the knowledge. I am always amused when ideas which I think are genius and new, pop up elsewhere, having already been tackled by other more established artists. I like to think the ideas are floating in the ether, but more likely it’s inspiration which is borne of reading and looking at things over the years. I used to feel frustrated, cheated even, then I realised that it’s brilliant! All the work combined is easier to work on, to build on, as parts of the building are shared. Back at the beginning of this year I watched Vik Muniz on TED and was reminded of having been introduced to his work by a previous tutor (Mr Phil Tyler). 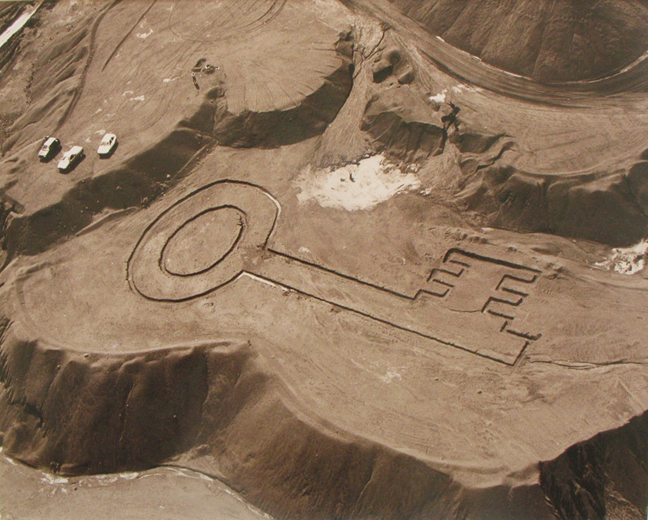 At the time I was struck by how he played with scale, making huge earth drawings which are visible only from the air, and making small ones nearby which can be approached and appreciated. I was making oversized building blocks, and recently have been making oversized SIM cards and sculptures inspired by the telephone wire. Whilst I am confident that I am not in a position to tackle large-scale issues of social action, my focus on materials and objects which I womble or salvage is able to channel that awareness somehow back in on itself. Vik Muniz achieves this on a significant scale as his materials-based practice feeds back into the ‘material’ itself in this case the individuals featured in the project. It has stuck in my mind, and sustains me during the dark moments when, overwhelmed, I question the point of it all, art. Unquantifiable in the plain supply and demand terms of Keynesian economics, art nonetheless is able to straddle that world and the world of human values seamlessly. Presenting opportunities for the observer to acknowlege or consider things differently or more intensely than they would have done otherwise is a very valuable effect which drives my work. In reclaiming and repositioning objects and materials, I can respond to them and their settings to cherish or challenge them. The process of putting the final work together for our upcoming degree show has crystalised all this for me, as my work has turned into a cherishing of the studios, gratitude and lament to times past, and a few small repairs to sustain it for the future. I first saw the image of Orozco’s 1997 work ‘Black Kites’ in the book Vitamin D, and it caught my attention in particular as I was working on ideas of 3d drawings myself at the time. Seeing the work first hand was moving- you can’t help but consider the person this skull first belonged to. That orozco spent 6 months painstakingly drawing the design on it when he was recuperating from an illness himself seems to me to provide an insight into the link between the art and the material. All the publicity around this show at Tate Modern made me mistakenly assume that I knew where he’s coming from, so thought I’d prioritise seeing another show on this trip to London. As it turned out I was aiming for Susan Hiller, only her show is at Tate Britain… So I went to Orozco instead. Which is lucky. Because I loved it. Orozco’s work is straightforward, intelligent and direct. He presents us with his take on the world, his observations. In his own words art makes the viewer feel ‘individual and conscious’, and it is his ability to convey his individual interests in a way in which the objects and drawings seem familiar and absurd which I find really inspiring. 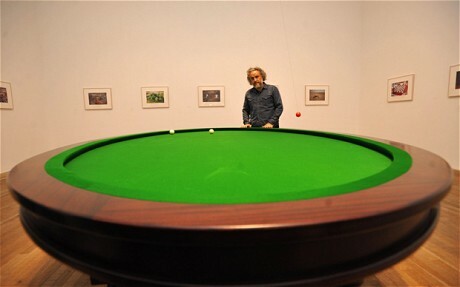 In his work Carambole with Pendulum (1996) he presents an oval form of a French game (he freely admits that he is obsessed with circular forms, as he has always considered them ‘the most perfect things’), with the red ball suspended over the centre of the baise. The aim of the game is to strike a white ball with the cue and hit the red ball as it moves. This is made harder in Orozco’s version as the red ball swings gently up and out of reach. In another room housing 2010’s Chicotes, the atmosphere was heavy with the small of old tyres. The arrangement of the blown-out fragments on the floor made it seem like a collection, and the violence of the explosions in evidence again succeeded in reminding me of the drivers whose tires these had been. Are they ok? Did they ever reach their destination? The display was orderly, and we were able to walk along one side of it, passing observers. The less successful part of this exhibit was the written accompaniment on the wall. 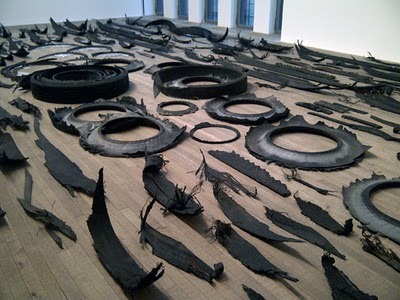 In this it was referred to that the moulted pools of metal amongst the tires are aluminium, supposedly (‘ calling to mind the fragments of the cars themselves’). This seemed ungainly to me as I have yet to see an aluminium car, and these tires were burst rather than burned. Far better to appreciate their solidified curves and colour in contrast to the frizzled blacks of the tires themselves. Looking at exhibitions like this, I always swing wildly between excitement and despondency: excitement that there are other people in the world working in a way which i identify with and enjoy, and despair that all these things have already been done, leaving less space for my ideas in the world. Orozco’s concepts of humanity, both poetic and at times brutal, always playful and considered, is a model for me to respond to, rather than feel reduced by. The artist’s mindful approach to making is a fundamental approach which has narrative and poignancy. 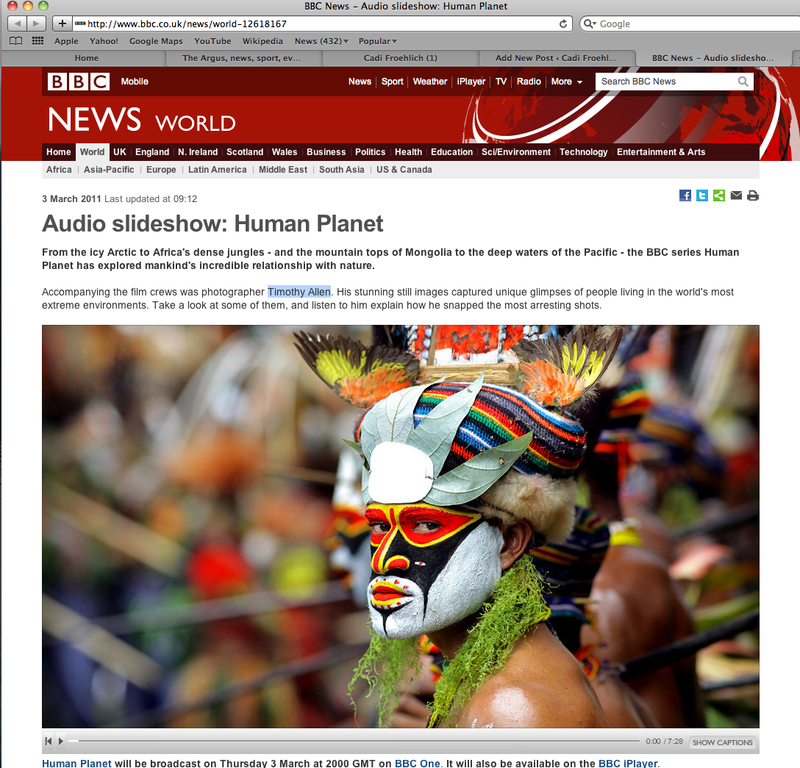 The BBC photos accompanying Human Planet by Timothy Allen are absolutely gorgeous, lush of colour and rich in subject. Photojournalism seems to inhabit the medium fully, as it captures a moment for us to appreciate long after it passes, and is particularly relevant to these subjects. The cultures and Peoples, sensitive to environment and human interference, are archived here in rich detail. The dichotomy of the resources and processes required to take the pics, and the effect it has on the sum total also appeals to me. Waiting to enter the space created a sense of anticipation- seats were limited- and the sense of occasion was palpable. On entering we are faced with a large construction occupying most of the space in the room, and around it are arranged chairs, one to each slot cut in the side of the construction. We take our seats, as if at a dinner party, but we are isolated from each other. Six of us sit, but each can only see their direct neighbors on either side. The outside of the construction is untreated, but smooth. The slots cut in the side are at about head height- it’s instinctive and natural to lean forward and look through to the interior. Inside every surface is painted white, and it is startling to see five pairs of eyes looking with you. Inevitably, as there is nothing else noteworthy inside, the others’ eyes draw your gaze, in particular those of the person sitting across from you. No other part of them is visible, nothing to distract or divert your gaze, only the eyes remain, looking back at you. Expressions are hard to read with no facial clues, but eyes widen and sparkle in reaction to this pure and intimate act of looking. http://www.re-worked.com is Web-art, for want of a better word, the result of collaborating with Peak District farmers Ken Wilson and Brian Bellfield, in a year-long residency. This site brings together, match-makes and juxtaposes images, media and associations. I first saw Kate Genever’s work at the RCA show in 2007, and it has influenced my own practice ever since, in particular the piece entitled ‘Neither work nor play’ which featured a ball of string with knots tied at small intervals along the length of it. It appeared to never have been unwound. This painstaking acknowledgement of the worthwhile futile actions we make really charmed me.